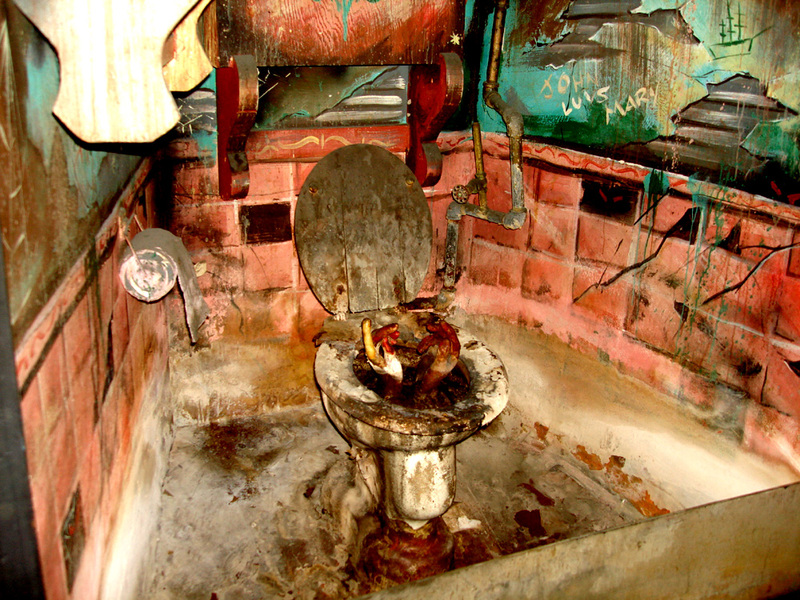 The bathroom, in my opinion, is the most detailed and fantastically humorous stunt inside the Haunted House. Although it doesn’t scream for attention, it holds an enormous amount of Tracy detail and is one of the few stunts that actually tells a story. As your car turns right after coming out of the train tunnel, a small, dangling light bulb pops on in an instant casting light onto this dirty facility. The first thing we notice is an early 1900’s style toilet complete with the water closet-tank mounted on the wall and shelving to the left of it. The toilet noticeably has a pair of hands reaching out of it; oddly enough, the hands are not reaching out in panic or with a sense of a urgency, but rather, reaching out with a sense of curiosity and intrigue, almost as if the victim was saying “what’s next?” The crooked pipe on the right going up the corner has obviously had one too many bad plumbers working on it. 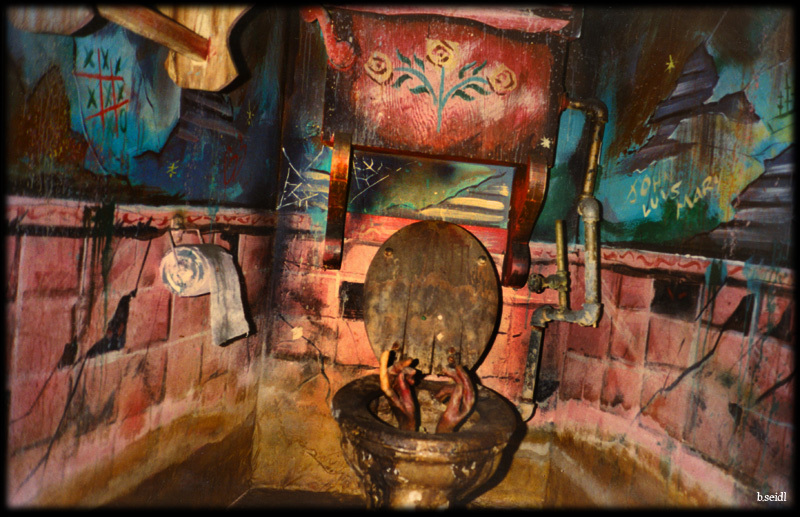 If you are lucky and visit the ride during a warm time of the year, the bathroom will have water pouring out of the toilet and filling up the basin. The digital sound loop that plays while your car passes by this stunt contains that of bubbling and a male victim’s voice saying “help”. Notice, I did not state the victim was yelling help; he simply says it, as if he is content. 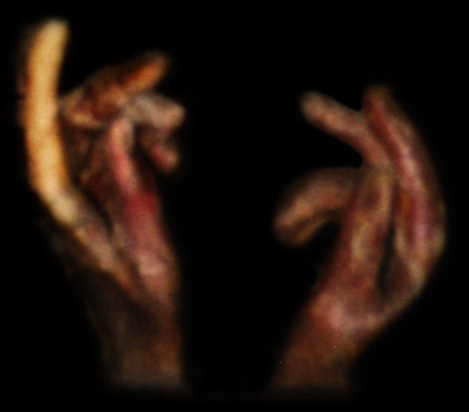 But, it is evident that the hands coming out of the toilet are a female’s; at least, that is what we are led to believe. You can listen to the bathroom digital sound loop here. The detail in the paint work for this stunt is extraordinary. The pink-colored painted tiles and the bluish-green decaying walls above make this a creepy addition. What I noticed most, though, is the writing on the walls. 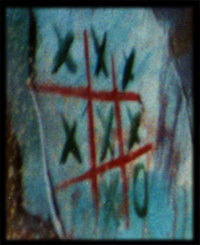 The tic-tac-toe game on the far left, the “John Luvs Mary” on the right, and the doodle of a ship scribbled beside that. Also, “G3” is scribbled on the left near the corner in red. What this means? I don’t know. Whoever was sitting here, be it a man or woman, certainly seemed to have a nautical background. Maybe a pirate or ship-mate was the one who drew on the walls before he fell in. Or, maybe these markings are from years prior. I guess we will never know. And, the toilet paper looks a bit worn out and dirty. Let me put it to you this way; I would never use it. But, I guess in any guest’s time of need, they will be forced to. I have seen many other Tracy bathrooms in other dark-rides, most of which are not even in existence anymore, and this one seems to be the most detailed and pronounced.